Peavey PowerSlide Square Neck...Nice. OVERVIEW The lap-type steel you can play standing up. It's not a lap steel, not a resonator, and it's not a conventional steel guitar. This instrument is in response to a huge number of requests for a lap-type steel that could be played standing up. The shape of the Power Slide is designed to position the playing surface (fingerboard) to the left of the player's body allowing unhampered access to the playing surface. 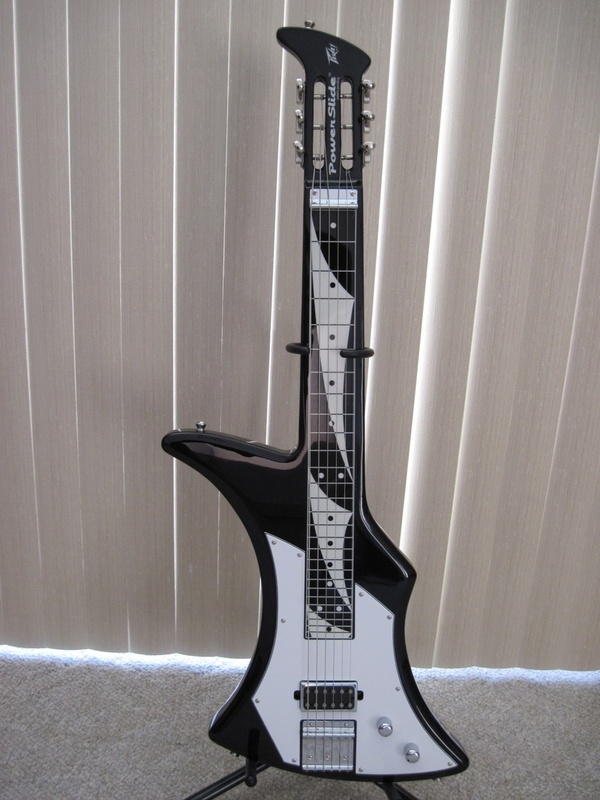 The Power Slide Guitar's unique 4-point suspension and the special "Y" strap enable the instrument to be played either horizontally or vertically (and almost anywhere in-between). The Power Slide uses Peavey's unique magnet loaded humbucking pickup with patented "T-60 type" mode/tone control. The 2-octave scale provides more tonal flexibility than any Slide guitar that can be played standing up. Peavey's "Power Slide" comes with its special "Y" strap and a padded bag to accommodate its "different" shape. With a 6-string configuration, you're already familiar with the string gauges and tuning, and at this price, you can't lose. Includes gig bag. FEATURES Revolutionary next generation slide instrument Ergonomically designed for maximum playability Patent-pending multipoint strap system Allows for multiple vertical and horizontal playing styles Unique magnet loaded pickup with patented variable coil mode control Radical patent-pending design provides unprecedented neck access in vertical playing position Includes gig bag, slide and multipoint strap.